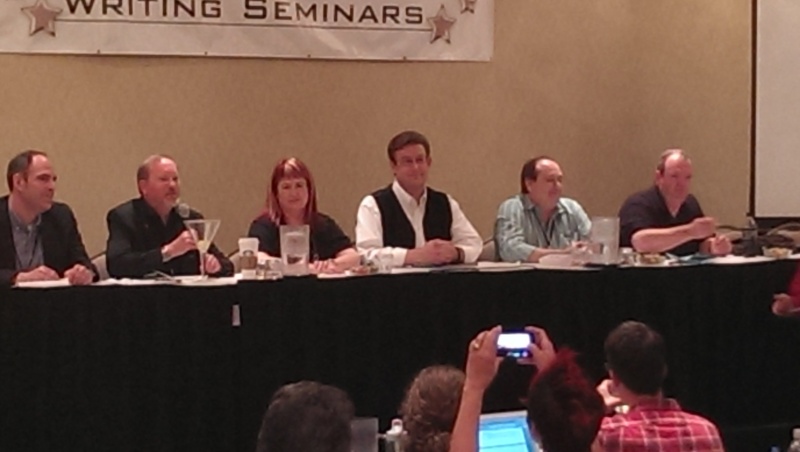 Two weeks ago I was in Colorado Springs, attending the Superstars Writing Seminar. This was my second time attending. I had been looking forward to this trip for a long time – last year’s seminar had been a revelation for me. Among other things, it convinced me to start this blog. The only way I can describe the experience of attending of Superstars is it’s like your brain being lit on fire. Spending three days in the company of sixty people who all share my passion for writing is remarkably inspiring. Between talks covering every aspect of publishing you can imagine, I reconnected with old friends and made some new ones. This year I ate with James Owen. James astounded me with his talk last year and it was just as good this year. He’s monumentally inspiring; his ability to eloquently describe his approach to things and how he’s overcome a lot of adversity is remarkable. At the end of the dinner he had us all sign a dollar bill and informed us that was good for a stay at the guest room in his personal workshop in Arizona, should we ever want to work in a project in a place designed to foster creativity. I know I’ll be taking him up on that offer as soon as I can. Tracy Hickman, who wrote the famous Dragonlance novels in the 90s with Margeret Weis, was there, replacing David Farland who had to miss the seminar. Tracy was a remarkable speaker – his answer to the question ‘what writing means to him’ had the room in tears – but more importantly, he was an incredibly nice man. He offered to critique our novel pitches; I managed to stammer out mine and got some great feedback (better yet, he though I did a good job!). I think the thing that stuck with me most was a quote from Tracy’s talk. “Why do we write?” He asked. “We write to inspire.” That really resonated with me, because it’s what I hope my writing will do, one day. I know other people’s writing has inspired me; to wonder and to dream, to learn and to read, to write; to be a better person. The heroes in stories might be imaginary but the lessons they teach are not. If you’re someone who’s serious about writing and wants it to be a career someday, you should go to Superstars next year. They’ll be announcing the dates soon. I know I’ll be there. This entry was posted in Awesome People, Workshops, Writing.